We know what you ate last Halloween. Actually we don’t, but we can recommend the perfect additions to your scarefest spread – do you want to trick or treat your guests? Whether you’re having a Saw marathon, or a fancy dress fiesta, we’ll keep the ghouls and your hunger at bay. 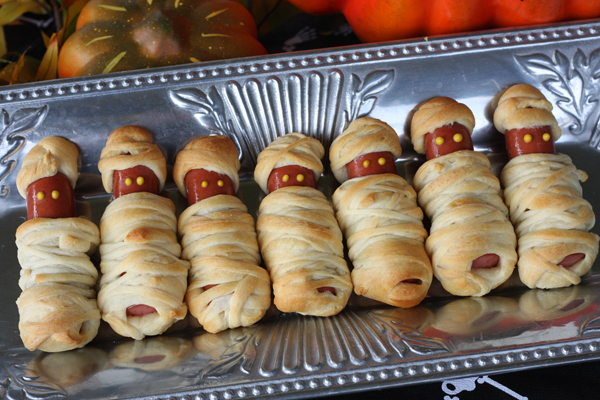 Mummy Hot Dogs – The Mummy Returns with this spooky twist on a party classic! The bandages are unravelling and your hot-dogs have escaped from their tombs onto your plate. To make these, buy the creepiest sausages you can find and wrap them in strips of puff pastry – add a pair of eyes in mustard or ketchup… if you dare! Spooky Spider Devil Eggs – Serve up these 8 Legged Freaks by boiling eggs and halving them, before arranging your olive creature to terrorise your guests. Frankenstein’s Pizza Fingers – This is a monster treat for any would-be mad scientists. Get your hands on a packet of pizza dough mix (or make your own if you’re feeling inventive), mix in some green food colouring and shape into fingers before baking. Add cheese and tomato paste to form your nail. IT’S ALIVE! Eyeball Tacos – Use any hardshell taco recipe and once you’ve piled in your filling, top with 2 dollops of sour cream to make the eyes and sliced olive for the pupils – we’ve got our eyeballs on you! Halloween Crisps – No party would be complete without a good selection of crisps. Local convenience and money saver shops have lots of Halloween themed snacks available, go crazy! Red Pepper Houmous – Buy a jar of red peppers (or roast your own if you’ve got the time) and then whack them in a food blender with a tin of chickpeas, garlic, lemon juice and olive oil. This one’s a screamer! Guacamole – It wouldn’t be Halloween without including some green goo – just ask Ghostbusters’ Slimer! Mash up some avocado with some chopped red onion and cherry tomatoes, season with coriander and lime juice. Who you going to call? Your friends round to try some guac! Salsa – As in the dip, because the only dance you should be doing is the Monster Mash! Tomatoes, coriander, lime juice and red onion together form a gore taste sensation good enough for any slasher movie. Add chopped chilli if you’re feeling dangerous. Blackbeard Bean Dip – Nothing says Hallowen like a gross coloured dip! And what better way to make this than using black beans? 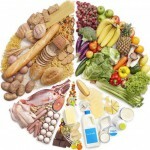 Take a look at this easy recipe and whip it up, yeah! 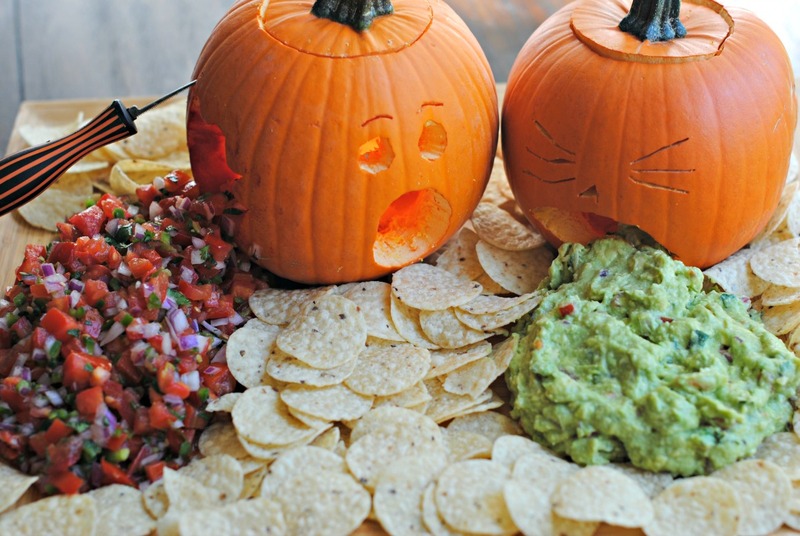 Terrifying dip tip: All of the above dips can be used to create a nighmarish centrepiece to remember, by serving either in or oozing out of your carved pumpkin. Frozen Banana Ghosts – Booooooooooooooooooooooo! (That’s a scary ghost right there.) Chop your bananas in half and put onto a lollipop stick. Cover with melted white chocolate and sprinkle over some desiccated coconut; pop on some dark chocolate drops for eyes, and put your Caspers in the freezer for at least 4 hours before your guests arrive. Halloween Jelly – We don’t think you’re ready for this jelly… but we’ll tell you anyway. Buy strawberry, raspberry or lime jelly packets, follow the instructions given but halfway through the setting time, add the spookiest and slimiest sweets you can get your hands on. Before someone can say “Hocus Pocus”, you’ll have slimy dessert for even the hungriest of witches. Caramel Apple Cupcakes – After the horror of the Great British Bake Off being over (sob), instead of bobbing for apples this Halloween we’ve found a cupcake recipe to satisfy your sweet tooth – this is all treat, no trick! Marshmallow Monsters – I was working in the lab, late one night when my eyes beheld an eerie sight, a marshmallow monster gang! To form your thriller pack, melt white chocolate and add in food colouring of your choice before covering your marshmallows (on a lollipop stick for ease) and setting in the fridge. 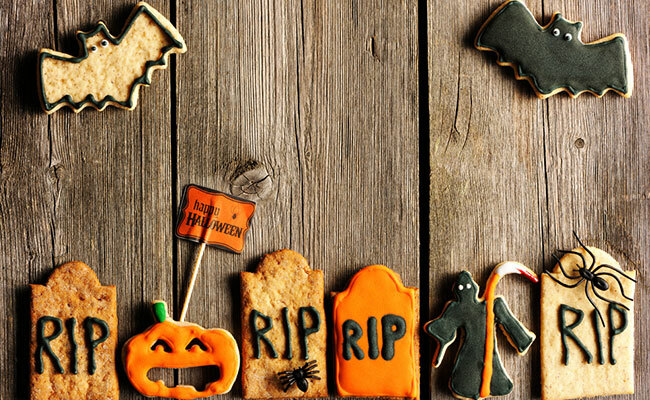 Create ghoulish faces with icing and chocolate. Brownie Graveyard Traybake – What goes bump in the night? Your housemate stealing some leftover graveyard brownie, if there is any… For this you can use any brownie recipe to form your base (we’ve got a budget recipe here for you!) and then cover in either chocolate ganache or icing. 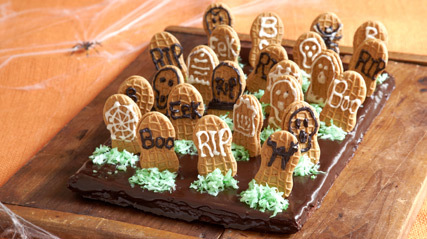 Decorate using biscuits for gravestones and icing for the detail, you could even pop a pumpkin or a ghost onto your scene if you wish. If you’re getting involved with our #CARVEntryPumpkins competition (which you should be! ), you may be wondering what to do with all that leftover flesh… From the pumpkins of course! We’ve thought of a few things you could try this Halloween. Pumpkin and Goats Cheese Dip - Looks can be deceiving – just ask Mr. Hyde’s victims – so don’t dismiss this bright yellow/orange dip! Peel, cube and roast butternut squash (toss in some herbs like sage and thyme, which you’ll have if you’ve followed our staples list). Once cooked, add the squash to a blender with goats cheese and a splash of oil. Roasted Seeds - Sometimes when you’re scooping out your pumpkin, the seeds are endless and you’re sat there thinking ‘what am I going to do with these badboys?’ Well, why not roast them for a tasty snack? Combine your favourite spices and coat the seeds, adding some oil as well. They won’t take too long to roast so it’s quick and easy. Pumpkin soup - Bubble bubble, toil and trouble. Fire burn and… PUMPKIN SOUP! A perfect autumnal warmer using leftovers can be made using any butternut squash recipe and substituting for pumpkin. Pumpkin risotto – This might sound really fancy but it’s actually pretty easy to get right. Using arborio rice, stock and herbs as the basics, added roasted pumpkin and other veg or meat of your choice. Similar to the above, you can find loads of butternut squash recipes. Roast pumpkin – It’s not just the seeds you can add some flavour to and roast – you can do the exact same thing with the flesh. Any combination of herbs, a good one to try is paprika, cumin and cayenne pepper for a bit of a kick. If you lay out this spread for your guests, they’re sure to be impressed! We hope you have a howler of a Halloween! Let us know how these recipes turn out via social media and the comments below.